Most popular science books either focus in on a specific bit of science, or explore the work of a particular scientist. However, every now and then, authors get the urge to go large - to take on life, the universe and everything. It’s what you might call the science writer’s midlife crisis - and this title typifies the genre. Of itself, this isn’t a bad idea, though it can be a struggle to decide how to organise such a vast subject matter, and the ‘big book’ syndrome frequently rears its ugly head. Because this is a big topic, either the publisher or the author often feels it has to be a big book. This translates into a painfully long book, something this certainly is, at over 400 pages. The result is page after page of waffle, which in a subject that naturally inclines the author to philosophy can be more than a little deadening. So, for instance, although Sean Carroll does actually put quite a lot into his opening section, it can feel like he’s spent 80 pages saying ‘things do or don’t have a cause, depending on what they are and what you call a cause.’ And there’s only so much you can take of that kind of thing. 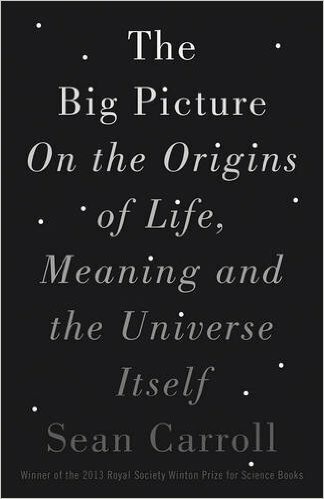 At the book's heart is the concept of poetic naturalism, which Carroll presents as the best scientific approach to universal topics. This amounts to having a clear naturalist approach (nothing is supernatural, everything can in principle be explained by reductionist means), but building on it the storytelling aspect of our understanding that takes us beyond the fundamentals like quantum theory to add on emergent aspects reflecting the world as we understand and experience it. The poetic naturalist knows that it's all particles and fields underneath, but accepts that we need the higher level stories to relate to the universe. Carroll covers this at great length in his six sections: Cosmos, Understanding, Essence, Complexity, Thinking and Caring. At page 159 we finally get away from philosophical hand waving, but given that, so far, Carroll has been hammering out each point at great length it's unfortunate that when he is on more familiar ground, he leaps into assumptions about what his readers understand. So we are told, for instance, that an electron in a hydrogen atom only gives off 'certain discrete wavelengths'. It's a shame that, while philosophical jargon was given pages of explanation, a word like 'discrete' which isn't commonly used the way physicists employ it, isn't given a brief explanation. When get onto the serious science bit, after acres of pages telling us about the difficulty of being certain of everything, it’s a wave of the magic wand and physics has all the answers (admittedly to a small subset of questions). It’s not that there’s anything wrong with the physics presented here, but the way it is described there seems a danger of falling into the trap Carroll himself identifies of declaring that nothing much new will emerge as we pretty well know it all. And after all the philosophical justifications and exploration, it feels unsatisfactory to be presented with the physics on a ‘this is how it is, and you have to believe it because I say so’ basis. This comes across particularly strongly in the description of crossing symmetry. The lack of explanation and justification here is disappointingly different from Carroll’s lucidly explanatory From Eternity to Here. The good news is that in the next section (Complexity) things finally get both interesting and better explained. As we move into biology, Carroll continues to keep the writing interesting and delivers significantly more than he has to date. Unfortunately, this doesn't last and we head back to the philosophising and logic-chopping as Carroll makes one of several attempts to provide a logical consideration of the existence or non-existence of God, saying that the fine tuning of the universe is probably the best argument for theism, but it proves to be a weak one. There's something dated about attempts to make logical and/or Bayesian arguments for or against a deity and it just doesn't do a lot for the reader. This is followed by a long, occasionally interesting, philosophical discussion of the nature of consciousness. Towards the end of the book, interest is re-kindled with some thoughtful material on ethics and we finish with an absolutely lovely chapter, where Carroll relates his move from his early Christian beliefs to a naturalist viewpoint. This is the best writing in the whole book - simple yet personal, and far more effective as a flag carrier for atheism than any of Dawkins' raging. Overall it's an odd book and one that has way too much philosophising and meandering for me to have enjoyed it. Interesting nonetheless. 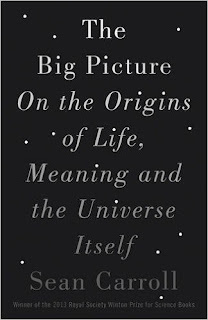 Without looking it up, I'm assuming that the author is the distinguished astronomer Sean Carroll, rather than the equally distinguished biologist Sean Carroll, also a writer of wide-screen pop-science books? It is indeed the astronomer - I didn't know there was also a biologist of that name!